There are certain puns that I literally cannot resist. 1) Just for the halibut. I think I say it every time I have halibut. 2) When in Rome. When I was in Rome, I got a lot of use out of that guy. 3) It’s all Greek to me. When I was in Greece, same as #2. This post is not about my humor, which you obviously know is much better than that. 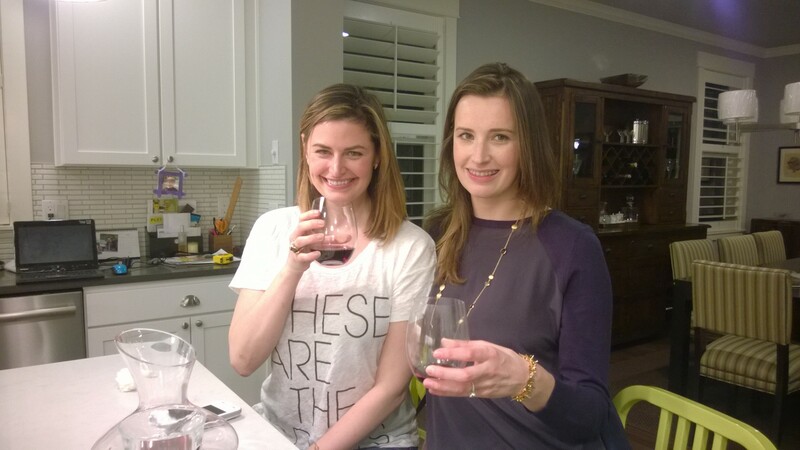 I had my first mini dinner party in my new digs on Friday night with my friends Nelle and Alyson, the same 2 lovely ladies I had dinner with for my Friday Night Plans post. Choosing a menu was the first step, the pressure was on for an outstanding meal (Nelle has her own food blog and is an amazing cook). For inspiration, I headed on over to the Barefoot Contessa’s website, which actually has a whole bunch of suggested dinner menus. Of course it does, Ina is a pro. I thought her Greek menu sounded springy and perfect and I love me some lamb. Sold. 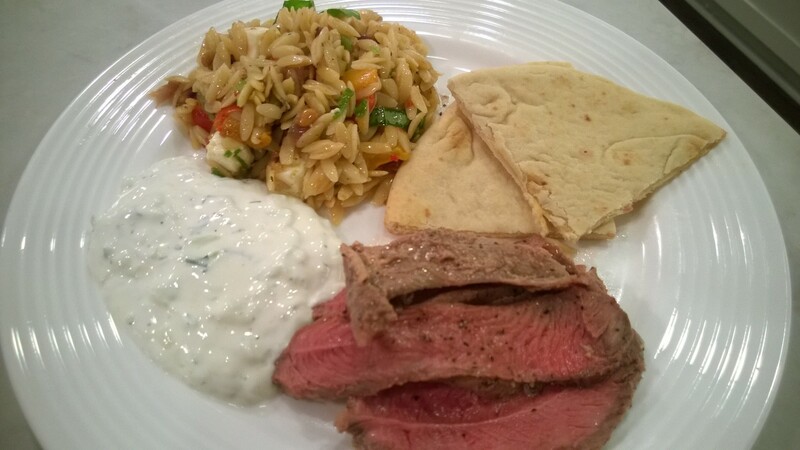 The menu: Roasted Leg of Lamb, Orzo with Roasted Vegetables, Tzatziki and pita and baklava for dessert. 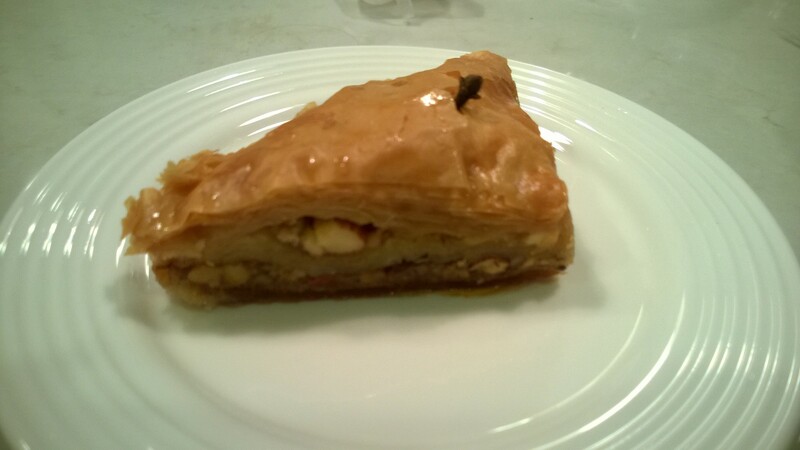 The pita and baklava I bought at this fantastic little Greek restaurant in Magnolia, Niko’s Gyros. 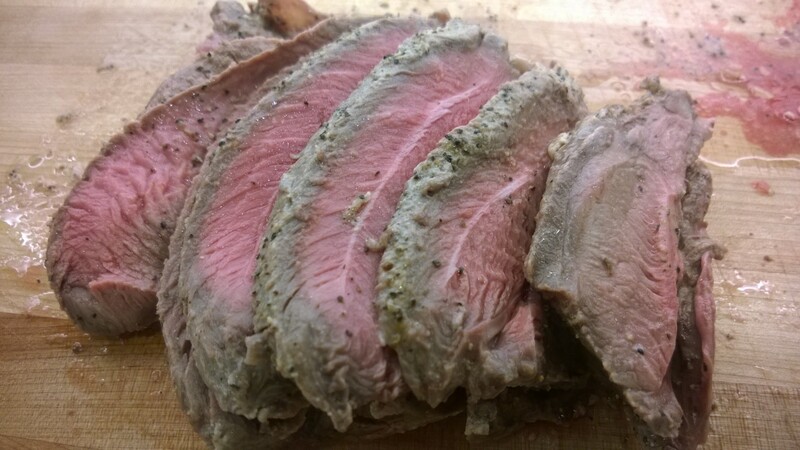 Note – Ina grills her lamb in this recipe. I am not a confident griller, I did mine in the oven. Combine the yogurt, olive oil, lemon zest and juice, rosemary, salt, and pepper in a large non-reactive bowl. Add the lamb, making sure it is covered with marinade. Marinate in the refrigerator, covered, overnight or for up to 3 days. Note – I marinated on Wednesday for dinner on Friday. Bring the lamb to room temperature, about one hour. Preheat oven to 425º. Scrape the marinade off the lamb, wipe the meat with paper towels, and season it generously with salt and pepper. 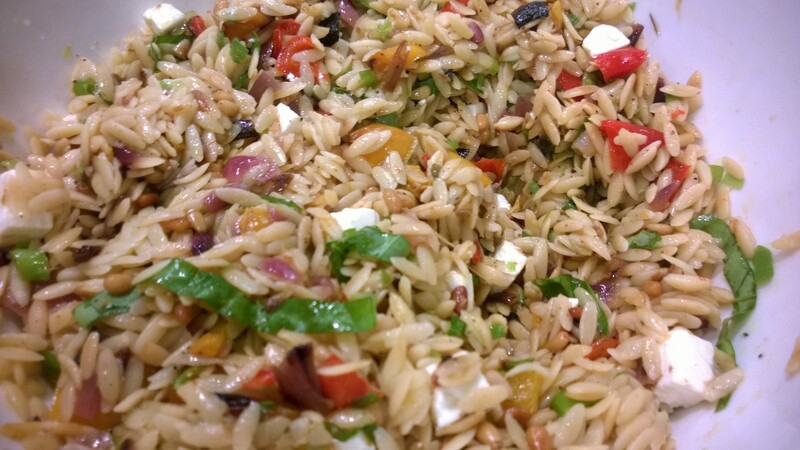 Bake for 20 – 30 minutes until the temperature is 120 to 125 degrees for rare. Remove the lamb to a cutting board, cover with aluminum foil, and allow to rest for 20 minutes. Then slice and serve. An amazingly fortuitous event occurred with the lamb. I couldn’t find my meat thermometer, it got lost somewhere in the move. The girls alerted me to the sweetest feature of my new Wolf oven, temp probe. The oven comes with a thermometer that plugs into the inside of the oven and you can cook your meat and set the oven to let you know when the meat gets to the desired internal temperature. Um, this was like Christmas. And I’m Jewish. Amazingness. The lamb came out perfectly. Place the yogurt in a cheesecloth or paper towel-lined sieve and set it over a bowl. Grate the cucumber and toss it with 1 teaspoon of kosher salt; place it in another sieve, and set it over another bowl. Place both bowls in the refrigerator for 3 to 4 hours so the yogurt and cucumber can drain. Transfer the thickened yogurt to a large bowl. Squeeze as much liquid from the cucumber as you can and add the cucumber to the yogurt. Mix in the sour cream, vinegar, lemon juice, olive oil, garlic, dill, 1/2 teaspoon salt, and pepper. You can serve it immediately, but I prefer to allow the tzatziki to sit in the refrigerator for a few hours for the flavors to blend. 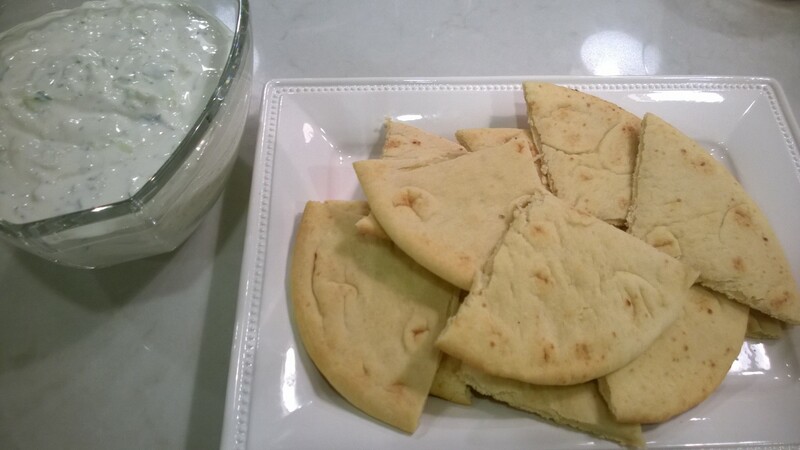 Serve chilled or at room temperature with warmed pita. This was a perfect Friday night. Great company, great food (if I do say so myself) and some wine was partaken as well. To all of you celebrating Easter, this would be a lovely menu for your dinner.